Brownies get a flavor makeover with the delicious addition of a cream cheese topping, and zero calorie sweetener helps lower the sugar content compared to traditional brownies. 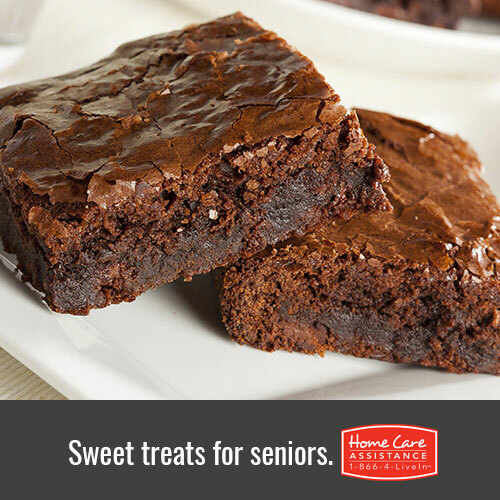 Next time your senior loved one has a serious craving for sweets, whip up a batch of these brownies with cream cheese topping, a favorite among the Harrisburg senior care experts at Home Care Assistance. Spray an 8-inch square pan with cooking spray and set aside. Place sugar and margarine in a bowl and beat with a mixer until light and fluffy. Add the egg, egg white, and vanilla extract. Mix well, then gradually add the flour and cocoa. Mix thoroughly. Pour the mixture into the square pan. In another bowl, add the cream cheese and sweetener and mix until smooth. Add the milk and beat well. Pour the cream cheese mixture over the chocolate mixture in the pan. Using a knife, swirl the topping to achieve a marbled effect. Bake the brownies for 30 minutes, and test for doneness with a knife or toothpick. Place the pan on a wire rack and cool completely before cutting. Helpful Hints: Do not use tub margarine for this recipe as they contain water and will give the brownies an undesirable gummy texture. Also, check the low fat cream cheese to make sure it does not have added sugar. Interested in learning more about senior health? Reach out to Home Care Assistance. We are the leading provider of senior home care in Harrisburg and can match a qualified Harrisburg senior caregiver to your loved one who can grocery shop, cook diabetic-friendly meals, do light housework, and provide transportation and mobility support. Give us a call at (717) 540-4663 to learn more about how we can help your senior loved one maintain a high quality of life.